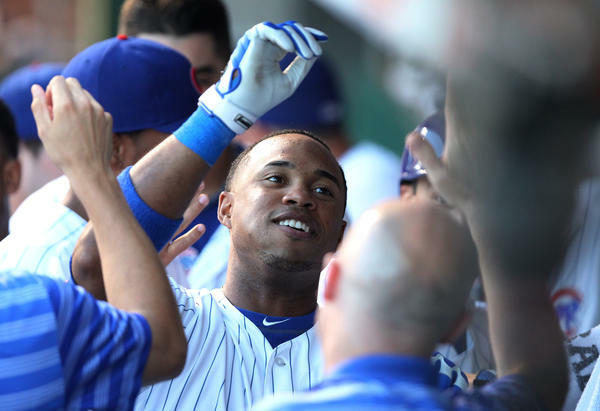 A late night car accident in Venezuela claimed the life of former Cubs infielder Luis Valbuena. The crash occurred after a Winter League game. Former Major League infielder Jose Castillo was also killed. Valbuena spent three seasons in a Cubs uniform (2012-14), becoming one of the most productive waiver claims in organization's recent history. Known for his infectious smile and staggeringly awesome bat flips, he compiled a .232/.330/.394 line in 1241 plate appearances during the rebuilding years before being packaged along with pitcher Dan Straily in a trade with Houston for Dexter Fowler. That's just sad to hear. Valbuena was one of the brighter spots on a very bad set of rebuilding teams. My condolences to his family and friends, and to those of Jose Castillo. Lots of great memories from a gritty utility player. I enjoyed watching Valbuena play for the Cubs and always wished him well afterward. I hope his family finds peace and comfort. Really fun player to watch. RIP Valbuena. The waiver replacement that was twice the ballplayer that Ian Stewart was. I remember Luis's yearly Cub slash line peaking at MUCH higher than .232/.310/.724, but then steadily dropping as he started too many games in a row. Luis would have been best if he could have started no more than 2 or 3 games in a row. Not that Dale had too many other 3B options to choose from among the infamous Joe Mather, Blake Dewitt, Ian Stewart, Josh Vitter, ... Yes, those WERE bleak years. Very sorry to hear this. Luis was one of the few bright spots in the lean years, and he became a personal favorite. Sad to hear this about such a young guy. I'll remember Luis as the guy who almost came out of his shoes whenever swinging the bat. He liked hitting the long ball. One report noted that the big rock was placed in the middle of the road strategically by bandits to cause an accident. The players were robbed and the vehicle looted. At least, the Police caught the four people responsible for the deaths. I just got back from a funeral. There are too many people dying way too young. Why didn't Morrow wait til opening day to have this elective surgery?? “It’s terrible what the left fascists have perpetrated”? Pretty sure there’s a no politics rule on this forum Slug. You've been around long enough to know that. Please save your ignorant bs for your Facebook page dude. Pretty sure there is a no personal attack rule too, dude. You guys know the rules. No politics, please. Louis seemed like a good guy and teammate, who was professional and got the most out of his ability. My sympathy to his family and friends. The yearnbefore Valbuena made the majors I sat in a round rock express game and talked to his family as they were so hopeful for him being called up. I know they are heartbroken. My prayers and thoughts go out to them. Harold Baines and Lee Smith have been elected to the Baseball Hall Of Fame. Both deserving of the HOF. Just not with me. I enjoyed watching both of the compete for many years. They were great guys. Just not sure I see them both as elite status. That is what Hall of Fame means to me. Lee was a Cub, so I'm happy. I agree it should be for the elite. Both were marginal but, Smith was fun a pretty darn reliable for a long time. shout out to former cub prospect Dan Vogelbach. He is having a breakout year.